Figure 1. Damage to the top canopy of wheat at the High Plains Ag Lab caused by subfreezing temperatures (May 6). Inset: close-up of damage. Figure 2. A wheat field at the West Central Research and Extension Center in North Platte (May 6). 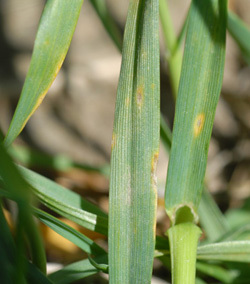 Inset: mottling on a wheat leaf indicative of virus infection. Figure 3. Tan spot lesions on wheat leaves at the UNL West Central Research and Extension Center (May 6). Figure 4. 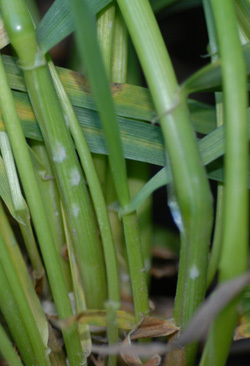 Powdery mildew pustules on wheat stems at the UNL South Central Ag Lab (May 6). As of May 8, there are generally low levels of wheat diseases across the state. 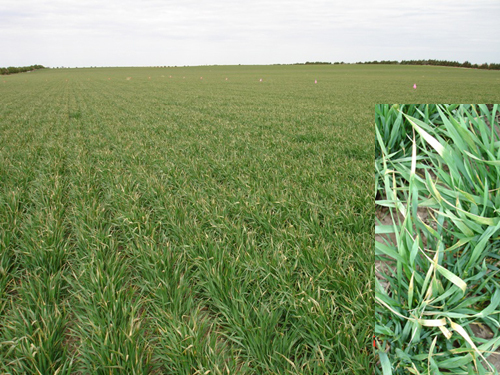 At the High Plains Ag Lab near Sidney on May 6, disease symptoms were not observed in wheat fields. However, there was extensive damage (Figure 1) to the upper canopy caused by the recent blizzard that occurred on May 2. Affected parts of leaves appeared bleached (Figure 1, inset). This damage most likely resulted from subfreezing temperatures. The wheat crop is expected to recover from the damage fairly soon. 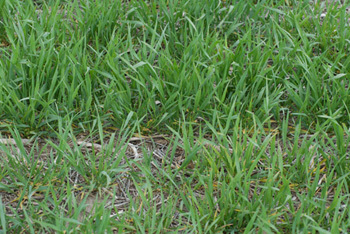 At the West Central Research and Extension Center in North Platte on May 6, the wheat crop looked healthy (Figure 2). There was a low incidence of leaf mottling indicative of virus infection (Figure 2, inset). Wheat soilborne mosaic virus has been confirmed in field samples from the North Platte area. Trace levels of tan spot were observed mainly on the lower leaves (Figure 3). At the South Central Ag Lab near Clay Center on May 6, powdery mildew was just starting to develop in the lower canopy in one field, with trace levels of disease appearing on the stems (Figure 4). In a second field, moderate to severe levels of tan spot caused yellowing of lower leaves and stunting of wheat plants (Figure 5). At the Agricultural Research and Development Center on May 7, soilborne mosaic virus was prevalent in wheat fields, but at low incidence. In some fields a few plants were rosetted (severely stunted) by the virus (Figure 6). There were trace levels of Septoria leaf blotch, tan spot, and spot blotch on the lower leaves in early planted fields. Late planted fields were free of fungal diseases, but showed symptoms of soilborne mosaic virus. To date, the Plant and Pest Diagnostic Clinic has processed 15 wheat samples. The following viruses have been confirmed in these samples: wheat soilborne mosaic virus (WSBMV) (majority of samples), wheat streak mosaic virus (WSMV), high plains virus (HPV), triticum mosaic virus (TriMV), and barley yellow dwarf virus (BYDV). Each of two samples tested positive for HPV, WSMV, and TriMV. One sample tested positive for TriMV and WSBMV and one sample tested positive for WSMV and WSBMV. As of May 8, no rust diseases have been observed or reported in Nebraska. However, leaf rust has been reported in north central Kansas counties, including Republic County which borders Nebraska. Stripe rust has been observed in Sedgwick County in South central Kansas. Figure 5. 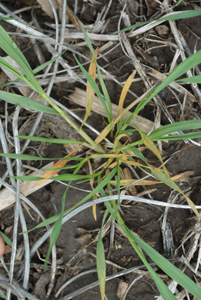 Yellowing of lower leaves and stunting of wheat plants caused by moderate to severe tan spot infections in a wheat field at the South Central Ag Lab (May 6). Figure 6. Rosetting of a wheat plant caused by wheat soilborne mosaic virus at the Agricultural Research and Development Center (May 7).